This Hinkley Marina 1 light small outdoor wall lantern with ribbed holophane glass shade is finished in hematite and rated IP44. Featuring a stepped circular wall mount and short straight arm supporting a small downward facing lantern, with wide brimmed sloping lid, outer protective cage and ribbed holophane glass shade to diffuse the light. An eye catching exterior wall light with a nautical influence that is the ideal choice for any modern or traditional style. 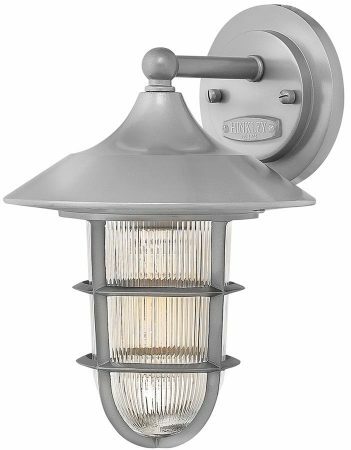 There are matching fittings in the Marina collection that include a medium wall light and flush outdoor porch or bulkhead light; please see below. This outdoor light is supplied by Elstead Lighting and designed in the USA by Hinkley, founded in 1922 in Cleveland, Ohio. They have transformed from a small outdoor lantern company to a global brand intent on bringing you the best in style, quality and value designs like the Marina 1 light small outdoor wall lantern with ribbed holophane glass shade featured here.